It is estimated that most cancers are caused by dysregulation of as many as 500 different genes. The root cause of cancer is the dysregulation of cell signaling pathways by the gradual alteration of regulatory proteins . The prevention and treatment of cancer needs pluripotent therapeutical agents that target multiple gene products. The polyphenol curcumin (diferuloylmethane), a yellow coloring agent which is the main active constituent in spice turmeric, has been shown to interact with a wide variety of biochemical proteins which are involved in cancer progression and modify their expression and activity. These modifications include inflammatory cytokines and enzymes, transcription factors, and gene products linked with cell survival, proliferation, invasion, and angiogenesis. It has been found that curcumin inhibits the proliferation of various tumour cells in cancer cell cultures, prevents carcinogen-induced cancers in rodents, and inhibits the growth of human tumours in xeno- transplant or ortho- transplant animal models, either alone or in combination with chemotherapeutic agents or radiotherapy. Several phase I and phase II clinical trials indicate that curcumin is quite safe and may exhibit therapeutic efficacy . The anticancer activity of the polyphenol curcumin has been examined in many published studies and is being further explored in dozens of ongoing clinical trials . Curcumin is a well-known phytochemical, which has been used since ancient times in India, China, tropical area of Asia for the treatment of various medical conditions. The biochemical and therapeutical effects of curcumin have been extensively studied over the last three to four decades. It has been used in several cancer cell cultures and in experimental tumours in animals and demonstrated potent antiinflammatory and anticancer effects, cancer preventive and antimetastatic behaviour. According to Shanmugam MK, et al (2015) curcumin suppresses the initiation, progression, and metastasis of a variety of tumors. The anticancer activity of curcumin is predominantly mediated through its negative regulation of various transcription factors, inflammatory cytokines, growth factors, protein kinases, and other oncogenic molecules. It also abrogates proliferation of cancer cells by arresting them at different phases of the cell cycle and/or by inducing their apoptosis. Several activities of curcumin target different pathways which are involved in the malignant phenotype of tumour cells, including the nuclear factor kappa B (NFKB) pathway. This pathway is deregulated in multiple tumor entities, including Hodgkin's lymphoma (HL). Indeed, curcumin can inhibit growth of HL cell lines and increases the sensitivity of these cells for cisplatin. Through various molecular mechanisms curcumin modulates regulatory proteins. Several research studies in vitro, in vivo and ex vivo have provided in-depth analysis of multiple targets through which curcumin induces protective effects against cancers of almost all human body systems (gastrointestinal, genitourinary, gynecological, hematological, pulmonary, thymic, brain, breast, and bone). different types of cancer. Curcumin is acting in a multifaceted way inhibiting several cell signaling pathways at multiple levels. The carcinogenicity is inhibited by the ability of curcumin to modulate the cell cycle by binding directly and indirectly to molecular targets including transcription factors (NF-kB, STAT3, β-catenin, and AP-1), growth factors (EGF, PDGF, and VEGF), enzymes (COX-2, iNOS, and MMPs), kinases (cyclin D1, CDKs, Akt, PKC, and AMPK), inflammatory cytokines (TNF, MCP, IL-1, and IL-6), upregulation of proapoptotic (Bax, Bad, and Bak) and downregulation of antiapoptotic proteins (Bcl(2) and Bcl-xL). A variety of animal models and human studies have proven that curcumin is safe and well tolerated even at very high doses . Curcumin significantly enhanced the efficacy of radiation therapy and reduced tumor growth as compared to control or radiation alone. Collectively, these results suggest a novel mechanism for curcumin-mediated radio-sensitization of cancer based on ROS generation and down-regulation of Prp4K [7,8]. Laboratory studies have found that curcumin is able to kill human lymphoma cells. The findings of Khan MA eta al (2012) indicate that HuT-78 cells are vulnerable to oxidative stress induced by curcumin and as a result eventually undergo cell death . Vishvakarma NK et al (2011) reported that using a murine model of a T cell lymphoma, the tumor growth retarding action of curcumin involves modulation of some crucial parameters of tumor microenvironment regulating tumor progression. Curcumin-administration to tumor-bearing host caused an altered pH regulation in tumor cells associated with alteration in expression of cell survival and apoptosis regulatory proteins and genes. Nevertheless, an alteration was also observed in biophysical parameters of tumor microenvironment responsible for modulation of tumor growth pertaining to hypoxia, tumor acidosis, and glucose metabolism . Goel A1, Aggarwal BB. (2010) did preclinical studies and reported that curcumin is a radiosensitizer and chemosensitizer for lymphoma, making chemotherapy and radiation therapy work better against the cancer while protecting normal, healthy cells. bortezomib, as it has been demonstrated with extensive research, within the last decade, in cell culture and in rodents. paclitaxel, vincristine, melphalan, butyrate, cisplatin, celecoxib, vinorelbine, gemcitabine, oxaliplatin, etoposide, sulfinosine, thalidomide, and bortezomib, as it has been demonstrated with extensive research, within the last decade, in cell culture and in rodents. Cancers of the breast, colon, pancreas, gastric, liver, blood, lung, prostate, bladder, cervix, ovary, head and neck, and brain and in multiple myeloma, leukemia, and lymphoma demonstrate chemosensitization . Several similar studies have also demonstrated that curcumin can sensitize a variety of tumors to gamma radiation including glioma, neuroblastoma, cervical carcinoma, epidermal carcinoma, prostate cancer, and colon cancer. It has been also studied extensively how curcumin acts as a chemosensitizer and radiosensitizer. Curcumin, for example, downregulates various growth regulatory pathways and specific genetic targets including genes for NF-κB, STAT3, COX2, Akt, antiapoptotic proteins, growth factor receptors, and multidrug-resistance proteins. Although curcumin acts as a chemosensitizer and radiosensitizer for tumors in some cases, curcumin has also demonstrated to protect normal organs such as liver, kidney, oral mucosa, and heart from chemotherapy and radiotherapy-induced toxicity. It appears that the protective effects of curcumin are mediated through its ability to induce the activation of NRF2 and induce the expression of antioxidant enzymes (e.g., hemeoxygenase-1, glutathione peroxidase, modulatory subunit of gamma-glutamyl-cysteine ligase, and NAD(P)H:quinone oxidoreductase 1, increase glutathione (a product of the modulatory subunit of gamma-glutamyl-cysteine ligase), directly quench free radicals, and inhibit p300 HAT activity. These preclinical studies are expected to give start to clinical trials, in order to prove the potential of this age-old golden spice for treating several cancers . This offers great potential for curcumin to be used in conjunction with radiotherapy for non-Hodgkin's lymphoma, in order to increase the efficiency of the treatmen . The treatment of Hodgkin's lymphoma (HL) with a multi-drug approach has been very successful. Nevertheless, due to the toxicity of the drugs becomes evident, after several years, the creation of secondary malignancies and cardiovascular disease. Therefore, the current goal in HL treatment is to find new, non toxic therapies that specifically target the deregulated signaling cascades, such as NF-kappaB and STAT3, which cause Hodgkin and Reed-Sternberg (H-RS) cell proliferation and resistance of apoptosis. In laboratory studies demonstrated that curcumin is incorporated into Reed-Sternberg cells and then inhibits both NF-κB and STAT3 activation, leading to lymphoma cell death and a significant 80-97% reduction in Reed-Sternberg cell viability. Furthermore, curcumin triggered cell death by apoptosis, as evidenced by the activation of caspase-3 and caspase-9, changes in nuclear morphology and phosphatidylserine translocation. The above findings provide a mechanistic rationale for the potential use of curcumin as a therapeutic agent for patients with HL . Saha S et al (2012) described how curcumin sensitizes cancer cells through regulation of multiple multidrug resistance pathways, thus employing one drug for multiple targets. Curcumin helps the cancer cells to regain their 'forgotten' apoptosis, modulates drug-target interaction at different levels, restrains survival pathways when their proteins are overexpressed, and finds an alternate way to carry forward the process of sensitization of different resistant tumours . Saha S, et al (2012) dissected the role of curcumin, if any, in targeting the major culprit of drug resistance, cancer stem cells (CSC), thereby circumventing resistance and strongly suggest that curcumin is a promising chemosensitizing agent and that the unique properties of curcumin may be exploited for successful management of resistant tumours . It has been reported, in animal studies, that curcumin retards lymphoma growth through several mechanisms. In mice with lymphoma, curcumin reduces oxidative stress in the liver by increasing antioxidant enzyme activities and suppressing reactive oxygen species (ROS) production, which in turn influences NF-κB activity, leading to a decrease in lymphoma growth [14, 15]. In another animal study, curcumin retarded tumor growth in a mouse bearing T-cell lymphoma by altering parameters of the tumor microenvironment, including hypoxia (low oxygen concentration), pH, and glucose metabolism . Curcumin selectively kills cutaneous T-cell lymphoma (CTCL) cells and inhibits the growth of Burkitt's lymphoma cells in animal studies. The phosphatidylinositol-3-kinase (PI3K) / protein kinase B (AKT) signal transduction pathway is commonly misregulated in lymphoma and associated with tumorigenesis and enhanced resistance to radiotherapy. Curcumin has been shown to inhibit the PI3K/AKT signal transduction pathway in several tumor models . Qiao Q, et al (2013) found that curcumin inhibits constitutive and radiation-induced expression of the PI3K/AKT pathway and its downstream regulator nuclear factor kappaB (NF-κB) in human Burkitt's lymphoma, a high-grade non-Hodgkin's lymphoma (NHL) [16, 17, 18]. They further demonstrated that the blockage of radiation-induced activation of the PI3K/AKT pathway and its downstream regulator NF-κB by either curcumin or specific PI3/AKT inhibitors (LY294002 for PI3K or SH-5 for AKT) enhance apoptosis in three human Burkitt's lymphoma cell lines (cells Namalwa, Ramos, and Raji) that were treated with ionizing radiation [ was found in the cells co-pretreated with curcumin combined with LY294002 or curcumin combined with SH-5 [17,18]. The results from this study suggest that curcumin might play an important role in radiotherapy of high-grade NHL through inhibition of the PI3K/AKT-dependent NF-κB pathway . Curcumin suppresses constitutive activation of nuclear factor-kappa B and requires functional Bax protein to induce apoptosis in Burkitt's lymphoma cell lines . Hussain AR1, et al (2008) demonstrated that curcumin treatment results in down-regulation of constitutive activation of nuclear factor-kappaB (NF-kappaB) via generation of reactive oxygen species where it causes conformational changes in Bax protein leading to loss of mitochondrial membrane potential and release of cytochrome c to the cytosol . This leads to activation of caspase-9, caspase-3, and poly(ADP)-ribose polymerase cleavage leading to caspase-dependent apoptosis. Additionally, curcumin treatment of Burkitt's lymphoma cell lines also causes up-regulation of DR5; however, this up-regulation does not result in apoptosis . Importantly, cotreatment with curcumin and TRAIL induces apoptosis in Bax-deficient cell lines. TRAIL means TNF-related apoptosis-inducing ligand and is a protein functioning as a ligand that induces the process of cell death called apoptosis . Taken together, their findings suggest that curcumin is able to induce apoptosis in Bax-positive cell lines, whereas combinations with TRAIL result in apoptosis in Bax-negative cell lines. These findings also raise the possibility that incorporation of curcumin in treatment regimens may provide a novel approach for the treatment of Burkitt's lymphomas and provide the molecular basis for such future translational efforts . Curcumin activates the antioxidant enzyme super oxide dismutase and down regulates the ROS levels as well as activity of ROS producing enzyme NADPH . Oxidative stress, an important factor in modulation of glycolytic pathway and induction of stress, activates genes. This process is further augmented due to reduced antioxidant defence system, which promotes cancer progression via inducing angiogenesis . Das L, Vinayak M (2014) analyzed the anticarcinogenic action of curcumin in liver, even after withdrawal of treatment in Dalton's lymphoma bearing mice. Oxidative stress observed during lymphoma progression reduced antioxidant enzyme activities, and induced angiogenesis as well as activation of early stress activated genes and glycolytic pathway. Curcumin treatment resulted in activation of antioxidant enzyme super oxide dismutase and down regulation of ROS level as well as activity of ROS producing enzyme NADPH: oxidase, expression of stress activated genes HIF-1α, cMyc and LDH activity towards normal level. Further, it lead to significant inhibition of angiogenesis, observed via MMPs activity, PKCα and VEGF level, as well as by matrigel plug assay. The findings of this study conclude that the long term effect of curcumin shows anticarcinogenic potential via induction of antioxidant defense system and inhibition of angiogenesis via down regulation of stress activated genes and glycolytic pathway in liver of lymphoma bearing mice . Curcumin also attenuates carcinogenesis by down regulating proinflammatory cytokine interleukin-1 (IL-1α and IL-1β) via modulation of AP-1 and NF-IL6 respectively in lymphoma bearing mice . Interleukin-1 (IL-1α and IL-1β) is a prototypic, potent, multifunctional proinflammatory cytokine affecting almost all cell types. Expression of IL-1 is up regulated in different tumor phenotypes and is implicated as an important factor in tumor progression via expression of metastatic, angiogenic genes and growth factors. Therefore, down regulation of expression of IL-1 may be able to inhibit cancer progression. Mechanism of transcriptional regulation of mouse IL-1α is not yet reported. AP-1 binding site at -12 to -6 on human IL-1α promotor is highly conserved in rat IL-1α gene and regulates its expression. Based on in silico analysis, regions -12 to -6bp is found to be conserved in human and mouse IL-1α gene promotor and therefore selected to study activation of IL-1α. Further, the regions -12 to -6bp in mouse IL-1α gene promotor corresponding to AP-1 binding element show 3'→5' orientation, necessary for AP-1 binding. The abovet work is focused on long term effect of curcumin on expression of IL-1α and IL-1β in liver of lymphoma bearing mice. Transcriptional regulation of IL-1α and IL-1β was analyzed by AP-1 and NF-IL-6 respectively. Elevated expression and protein level of IL-1α and IL-1β were found in lymphoma bearing mice compared to normal, which were significantly down regulated by curcumin treatment. Similarly, curcumin treatment down regulated activation of IL-1α and IL-1β via AP-1 and NF-IL-6 respectively. The findings conclude that curcumin attenuates carcinogenesis by down regulating proinflammatory cytokine interleukin-1 (IL-1α and IL-1β) via modulation of AP-1 and NF-IL6 respectively in lymphoma bearing mice . The various potent anticancer effects of curcumin on lympomas and other cancer cell caltures and experimental animals have been extensively demonstrated the last years. However, native curcumin has very low bioavaiulability due to its limited intestinal uptake and rapid metabolism. These properties limited its therapeutical use in humans. Even when very high dose of native curcumin are administered orally, only very small amounts of free curcumin reach the blood circulation and the targeted organs. The oral bioavailability of curcumin significantly improved after the creation of several curcumin formulations without altering safety parameters. Those formulations are ideally suited to deliver curcumin in human intervention clinical trials against cancer, including lymphomas. According to pharmacokinetic data for novel oral delivery systems, namely the concomitant administration of the adjuvant piperine with curcumin and the application of crystalline curcumin in a micronized form (curcumin micronisate) suggest an ~20- and ~ 28 fold increase in bioavailability of curcumin (based on area under the plasma concentration-time curve (AUC) or 2000% and 2800%, compared to native curcumin, respectively [24, 25]. Curcumin is transformed into its most bioavailable form, the liquid curcumin micelles through the unique technology NovaSOL® wich is available for capsules or softgels. Frutarom Switzerland Ltd. ,Health BU and Aquanova AG, the German pharma GMP manufacturer marketed NovaSOL® Curcumin, as dietary supplement. As demonstrated in a human clinical trial the liquid NovaSOL® Curcumin shows the superior bioavailability of over a standard curcumin extract . The liquid NovaSOL® Curcumin is a very stable, highly bioavailable solubilisate that enhances the effect and the multiple health benefits of curcumin and is effective at much lower dosages. The material results in a clear yellow solution in both water and oil due to its unique micelle structure. One caps contains 670 mg of NovaSOL® Curcumin (Liquid solubilisate of curcumin extract) with active curcuminoids: Min. 6%. (equivalent to approx. 8 gr standard curcumin 95%). 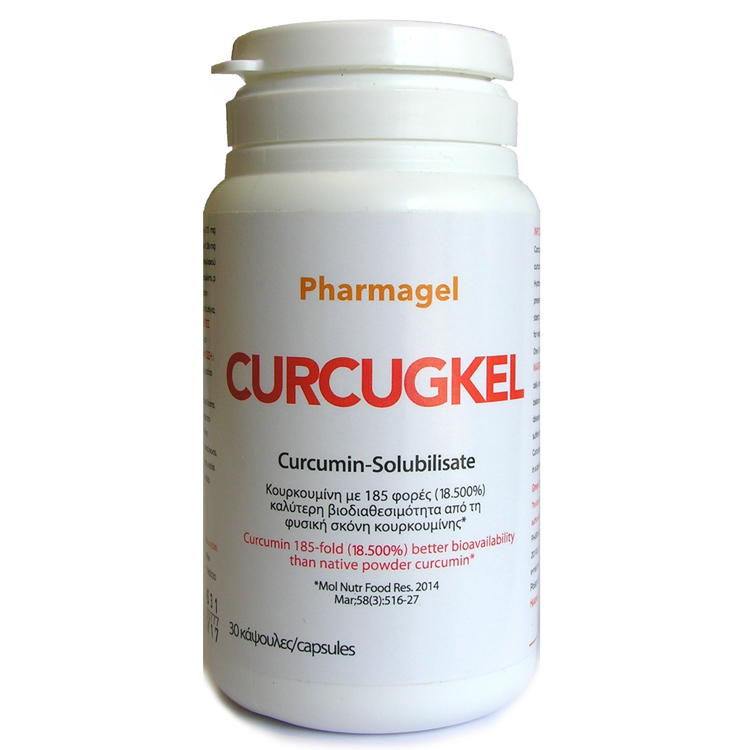 Curcugkel caps contain NovaSOL® Curcumin and circulates now in Greece. 1. Shehzad A1, Lee J, Lee YS. Curcumin in various cancers. Biofactors. 2013 Jan-Feb;39(1):56-68. doi: 10.1002/biof.1068. Epub 2013 Jan 10. 2. Kunnumakkara AB1, Anand P, Aggarwal BB. Curcumin inhibits proliferation, invasion, angiogenesis and metastasis of different cancers through interaction with multiple cell signaling proteins. Cancer Lett. 2008 Oct 8;269(2):199-225. doi: 10.1016/j.canlet.2008.03.009. Epub 2008 May 13. 3. Bandyopadhyay D Farmer to pharmacist: curcumin as an anti-invasive and antimetastatic agent for the treatment of cancer. Front Chem. 2014 Dec 23;2:113. doi: 10.3389/fchem.2014.00113. eCollection 2014. 4. Vallianou NG, Evangelopoulos A, Schizas N, Kazazis C. Potential Anticancer Properties and Mechanisms of Action of Curcumin. Anticancer Res. 2015 Feb;35(2):645-651. 5. Shanmugam MK, Rane G, Kanchi MM, Arfuso F, Chinnathambi A, Zayed ME, Alharbi SA, Tan BK, Kumar AP, Sethi G. The Multifaceted Role of Curcumin in Cancer Prevention and Treatment. Molecules. 2015 Feb 5;20(2):2728-2769. 6. Kewitz S1, Volkmer I1, Staege MS1. Curcuma Contra Cancer? Curcumin and Hodgkin's Lymphoma. Cancer Growth Metastasis. 2013 Aug 8;6:35-52. doi: 10.4137/CGM.S11113. eCollection 2013. 7. Shehzad A1, Park JW, Lee J, Lee YS. Curcumin induces radiosensitivity of in vitro and in vivo cancer models by modulating pre-mRNA processing factor 4 (Prp4). Chem Biol Interact. 2013 Nov 25;206(2):394-402. doi: 10.1016/j.cbi.2013.10.007. Epub 2013 Oct 19. 8. Gupta SC1, Patchva S, Aggarwal BB. Therapeutic roles of curcumin: lessons learned from clinical trials. AAPS J. 2013 Jan;15(1):195-218. doi: 10.1208/s12248-012-9432-8. Epub 2012 Nov 10. 9. Khan MA1 Gahlot S, Majumdar S. Oxidative stress induced by curcumin promotes the death of cutaneous T-cell lymphoma (HuT-78) by disrupting the function of several molecular targets. Mol Cancer Ther. 2012 Sep;11(9):1873-83. doi: 10.1158/1535-7163.MCT-12-0141. Epub 2012 May 31. 10. Vishvakarma NK, Kumar A, Singh SM. Role of curcumin-dependent modulation of tumor microenvironment of a murine T cell lymphoma in altered regulation of tumor cell survival. Toxicol Appl Pharmacol. 2011 May 1;252(3):298-306. doi: 10.1016/j.taap.2011.03.002. Epub 2011 Mar 11. 11. Goel A1, Aggarwal BB. Curcumin, the golden spice from Indian saffron, is a chemosensitizer and radiosensitizer for tumors and chemoprotector and radioprotector for normal organs. Nutr Cancer. 2010;62(7):919-30. doi: 10.1080/01635581.2010.509835. 12. Qiao Q1, Jiang Y, Li G. Curcumin enhances the response of non-Hodgkin's lymphoma cells to ionizing radiation through further induction of cell cycle arrest at the G2/M phase and inhibition of mTOR phosphorylation. Oncol Rep. 2013 Jan;29(1):380-6. doi: 10.3892/or.2012.2091. Epub 2012 Oct 19. 13. Mackenzie GG1, Queisser N, Wolfson ML, Fraga CG, Adamo AM, Oteiza PI. Curcumin induces cell-arrest and apoptosis in association with the inhibition of constitutively active NF-kappaB and STAT3 pathways in Hodgkin's lymphoma cells. Int J Cancer. 2008 Jul 1;123(1):56-65. doi: 10.1002/ijc.23477. 14. Saha S1, Adhikary A, Bhattacharyya P, DAS T, Sa G. Death by design: where curcumin sensitizes drug-resistant tumours. Anticancer Res. 2012 Jul;32(7):2567-84. 15. Das L, Vinayak M. Anti-carcinogenic action of curcumin by activation of antioxidant defence system and inhibition of NF-κB signalling in lymphoma-bearing mice. Biosci Rep. 2012 Apr 1;32(2):161-70. doi: 10.1042/BSR20110043. 16. Qiao Q1, Jiang Y, Li G. Inhibition of the PI3K/AKT-NF-κB pathway with curcumin enhanced radiation-induced apoptosis in human Burkitt's lymphoma. J Pharmacol Sci. 2013;121(4):247-56. 17. Li ZX1 et al (2009) demonstrated that curcumin could effectively inhibit tumor growth in the xenograft mouse model. The overall results showed that curcumin could suppress the growth of Burkitt's lymphoma cells in both in vitro and in vitro systems. 18. Li ZX1, Ouyang KQ, Jiang X, Wang D, Hu Y. Curcumin induces apoptosis and inhibits growth of human Burkitt's lymphoma in xenograft mouse model. Mol Cells. 2009 Mar 31;27(3):283-9. doi: 10.1007/s10059-009-0036-9. Epub 2009 Mar 19. 19. , Al-Kuraya KS, Uddin S. Curcumin suppresses constitutive activation of nuclear factor-kappa B and requires functional Bax to induce apoptosis in Burkitt's lymphoma cell lines. Mol Cancer Ther. 2008 Oct;7(10):3318-29. doi: 10.1158/1535-7163.MCT-08-0541. 20. Pitti RM, Marsters SA, Ruppert S, Donahue CJ, Moore A, Ashkenazi A (May 1996). "Induction of apoptosis by Apo-2 ligand, a new member of the tumor necrosis factor cytokine family". J. Biol. Chem. 271 (22): 12687–90. 21. Das L1, Vinayak M1. Long term effect of curcumin in regulation of glycolytic pathway and angiogenesis via modulation of stress activated genes in prevention of cancer. PLoS One. 2014 Jun 16;9(6):e99583. doi: 10.1371/journal.pone.0099583. eCollection 2014. 22. Das L1, Vinayak M2. Curcumin attenuates carcinogenesis by down regulating proinflammatory cytokine interleukin-1 (IL-1α and IL-1β) via modulation of AP-1 and NF-IL6 in lymphoma bearing mice. Int Immunopharmacol. 2014 May;20(1):141-7. doi: 10.1016/j.intimp.2014.02.024. Epub 2014 Mar 6. 23. Schiborr C1, Kocher A, Behnam D, Jandasek J, Toelstede S, Frank J. The oral bioavailability of curcumin from micronized powder and liquid micelles is significantly increased in healthy humans and differs between sexes. Mol Nutr Food Res. 2014 Mar;58(3):516-27. doi: 10.1002/mnfr.201300724. Epub 2014 Jan 9. 24. Shoba G, Joy D, Joseph T, Majeed M, Rajendran R, Srinivas PS. Influence of piperine on the pharmacokinetics of curcumin in animals and human volunteers. Planta Med. 1998 May;64(4):353-6. 25. Sasaki H1, Sunagawa Y, Takahashi K, Imaizumi A, Fukuda H, Hashimoto T, Wada H, Katanasaka Y, Kakeya H, Fujita M, Hasegawa K, Morimoto T. Innovative preparation of curcumin for improved oral bioavailability. Biol Pharm Bull. 2011;34(5):660-5.